Done. It’s completed, blocked, and ready for the 100 degree weather that we are having here. That’s not the point though, my 3rd Color Craving is completed. There were conflicting thoughts in my head whether I should use Color C for the border as written or if I should use Color A to make it more subtle. 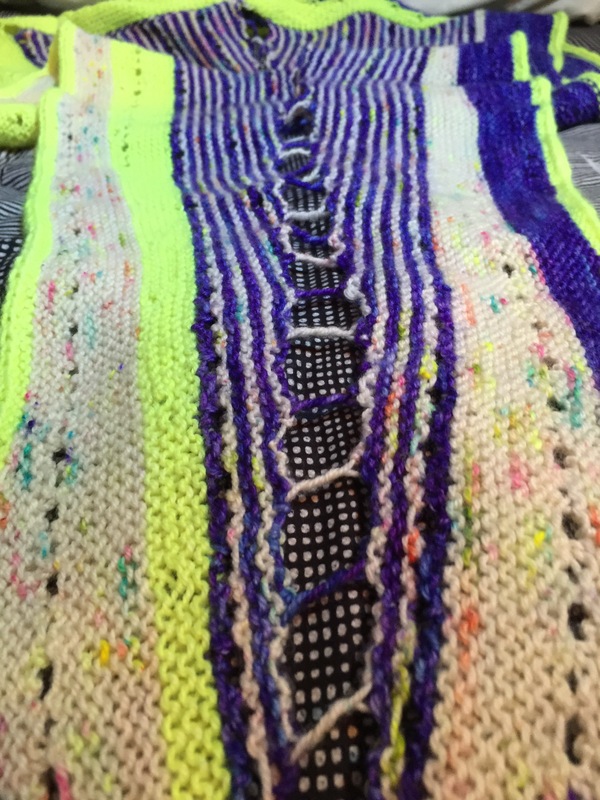 I toyed with both ideas and one of my knitting friends (Bear-Ears) said to me, “well you already put edison bulb in, so you might as well.” After that and looking at other projects that actually used that color in Color C I was convinced. 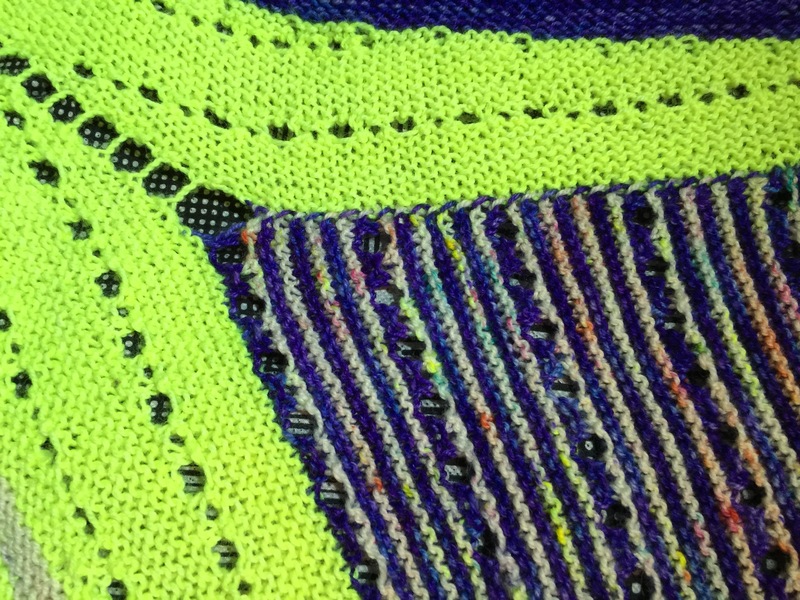 The results are perfect, bright, cheery, and I think I got another knitter to make another in bright colors like mine. I’m hoping to see that done, because knowing her she will finish it within a few days. So now that this project is done I have to choose something else to knit on. Two projects were actually chosen, Banana Leaf and finishing my Viajante. Banana Leaf needs a little more brain power, but not much. Mainly it’s managing the ribbing, moving the markers around (which I don’t like markers, I don’t use them unless the pattern uses “repeat till the marker”), and because it’s kind of a slick yarn that was chosen. Malabrigo Lace was the choice, in this stunning kind of royal purple, should be rather fetching when it’s done. 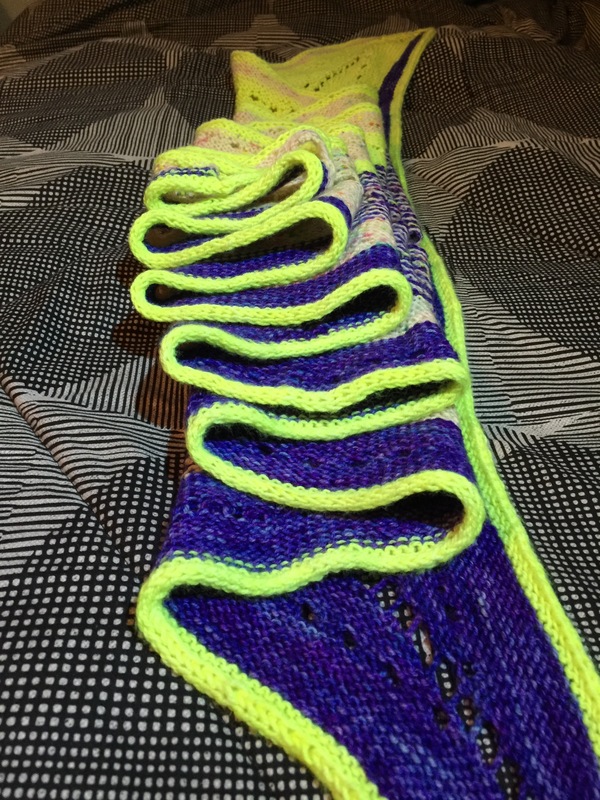 The worm hold to insanity (Viajante) just needs to be off the needles and it’s my just autopilot knitting, which some days you just need. That has become my morning, sipping on my cup of coffee knitting, which is perfect while I’m waking up. Now Stithces West 201q6 is comming up and I have to decide what I want to do for it. Decide f I want to take a class, if I’m going to buy anything, anything I want to knit and show off there, etc… Last time you remember I did not buy anything, didn’t take any classes, and I knit Sari to show off. 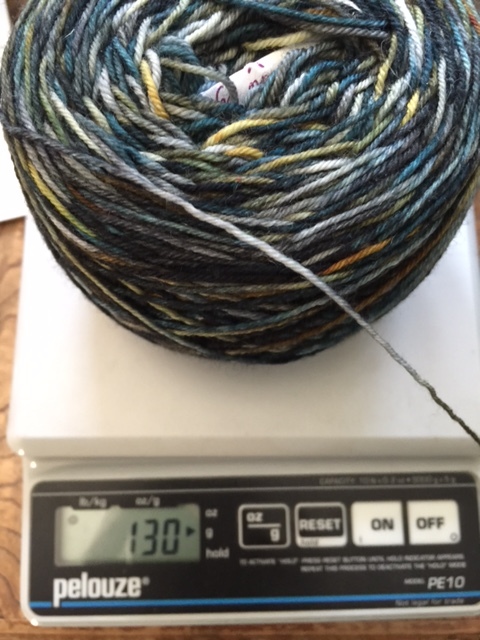 I think this year will be another similar, Bosphorus, which is in the same yarn, but not as intense. I’m thinking this will be a good kit to get, at the end of the year after I knit through the stash a bit. Have to contain it, I think it tries to get me in my sleep and I need to get it back into their plastic bin prison. My yarn inmates have been misbehaving and I’ve been a lazy knitting warden. No more of that, they will be in their bins and contained, no yarn buying till the end of the year (except a kit at the end of the year). I think we have established that I really like the bright colors, the ones that require you to wear sunglasses when you look at the final project. Even if it’s not that much of it you still need sunglasses. The 3rd color craving that I have been working on is just that, you might require sunglasses when you look at it. I think it’s quite fantastic, but I did have to make a modification to the pattern just so that people don’t go blind when they see it. The edging is either in the picot or icord, I always default to the icord, is supposed to be done in color c. If I did it in edison bulb I don’t think it would have the right effect, so I am going ahead and replacing color c with color a. Lets get one thing clear, I do not like actually knitting the icord, I just like the look of it. I think it gives it a really nice finished detail, especially on this project. Now that all sections are complete, I must make the journey around it, making icord and binding off, I’m not looking forward to it. I’m still unsure if I should follow the pattern or make my modification. It might not look right if I don’t use Color C, I’m thinking of the other pattern I used Edison bulb in Convergent, which I think looks good with the bright border. Such a dilemma that I am facing, bright border, or more muted border, as written, not as written. You know what, go bright or don’t finish it. Done and Done. Since I’m so close to the end of this project I am looking at what I should start next. There is a test knit that I’m going to start regardless, but I mean something that these needles can go right into once I’m done. I’m considering doing the hot pants, but then again I don’t know if I want to start those right now. Banana Leaf crossed my mind and I think that could be a fairly auto pilot knitting project, which would be good for me. There are a plethora of projects that I could start up, but I’m thinking of just using some of the newer yarn that I acquired first. That would mean banana leaf and hot pants, lots of decisions I have to make soon. Maybe I should just pick up the wormhole again (viajante) because it’s simple, straightforward, and doesn’t require much attention. I think I should do that, just not right now when the ball is still big and it takes up a lot of room in my bag. Just a quick note too, I’ve been doing a bit of editing of the photos that I took on my vacation and I’m quite pleased with them. I can’t wait to see them printed, metal prints are in my future, which I think some will become gifts. Lets get back to some knitting talk, which now will involve the stash. I have not been keeping up with the social pressure experiment, which is not good. I have decided that since it’s the beginning of September I will now be using only stash (unless a project needs another skein to be completed) until the end of the year. I will buy a kit at the end of the year, but that will be the only thing that I buy. I need to get the stash contained again, which means actually knitting with what I have. I’m going to probably go through withdrawals, must be strong. This has been a long time coming, due to my forgetfulness, and how things are picking up again this post was delayed. Now things are going to get even busier, school has started up which means my time went from available to deficit. The good side is that it will only be for 3.5 months or so, time should fly. Knitting time will be limited, but I’m going to try to get through as much as I can in the time that I have. I do have a finished Rockefeller to show off. I ran out of yarn twice. Once when I was on my way home from London, I ran it of the CC. Then when I was back I ran out of the main, both running out on the second wing. The main color ran out about 4 inches from the end, so I got some donated by a friend and it’s done. It’s blocked, not aggressively but it’s blocked. 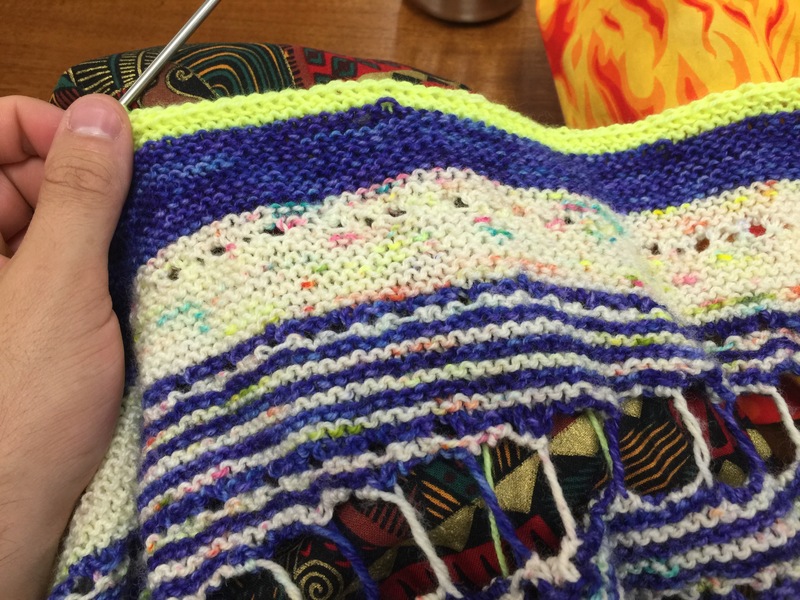 I didn’t want to block it too much because I know that the yarn that I used would grow quite a bit. That yarn that I used is my new favorite yarn base, Madelinetosh Twist Light. I can’t wax poetically enough about it, it’s the right thickness, takes the colors really well, feels really good to work with, and it’s a good price for yardage. That ties into what happened a 2 Friday’s ago, my LYS got in a new shipment of that yarn in some striking colors. I knew I have a lot of yarn, that I just got yarn on my trip (as restrained as I was), and that I need to work on cutting down the stash (social pressure and all). But I found a combination that I just couldn’t pass up on, something that I think will make you all question my sanity, or that I can actually still see colors after it. 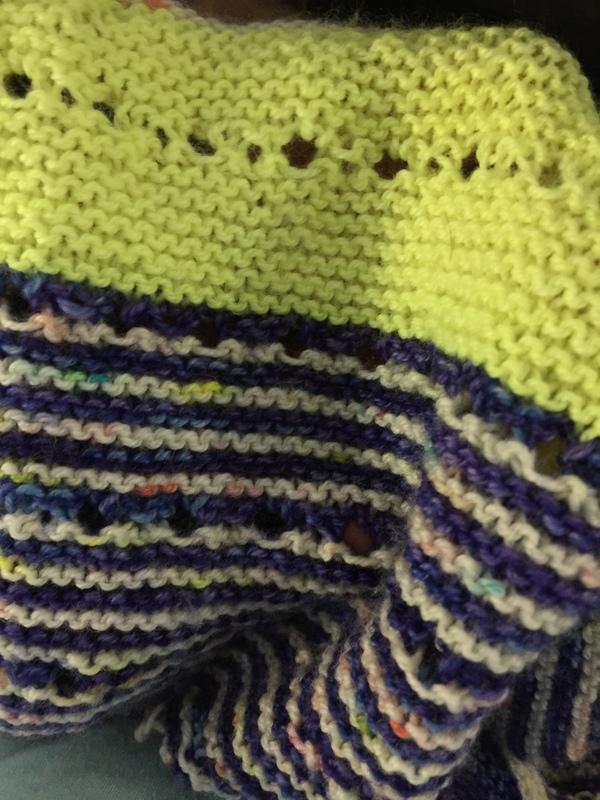 The sanity check had to happen especially after I figured out what pattern that I wanted to knit again with it. I’m making another Rockefeller, yes this will be my third. The colors that I chose are Vishnu, Cosmic Wonder Dust, and Edison Bulb. Yes that is a bright combination and it seems like something Stephen West would have chosen, but I like it. I wanted something really bright and I got it. Right now I’m on the third section and I forgot how much garter this is. But I need that with how little brain power I’m going to be having this semester. And finally I had a birthday this month, which isn’t a big deal, but for my LYS they give you a special birthday discount, so I had to get something. I looked every day that I was there, brought things back to the table to look at while knitting, putting them back when I left. I kept pulling out the same things and I knew that this wasn’t just a quick infatuation with the yarn, it’s yarn that was destined to be mine. Again you might question my sanity, but I think this will be fun to knit (and use). I got 2 skeins of the Malabrigo Lace in this beautiful purple that I’m going to make a Banana Leaf out of (the color is great for me), 2 skeins of the Sweet Georgia Trinity in a nice grey that will be the Suke-Suke Cowl (wedding gift), and 3 skeins of Madelinetosh Sport. Those 3 skeins are in a white (can’t remember the name right now) and Fluro Rose, which are destined to become a pair of sports hot pants (yes another Stephen West). All of my knitting friends say I have to model them once they’re done and yes I will have photos of them on me when they’re done. I think they are going to have a kick out of it, after their eyes are done burning from the intense color that I chose.